So many kids grow up without any experience of where fruit and vegetable comes from, so they have no connection to the food having never pushed seeds into the soil, never watched a plant grow nor picked the fresh, sweet berries off the bush… I have a feeling that this is one of the reasons why many people are so fussy about food – not enough parents introduce their kids to it. some of my friends are vegetarians, but a lot of them hardly like any vegetables (how can you be a vegetarian if you dont like vegetables?!). i think in 20 years your kid will thank you for planting all this stuff. im certainly grateful to my mum even if her horticultural pastime got a bit obsessive at times 🙂 tripping over pumpkins every day was a tad annoying. 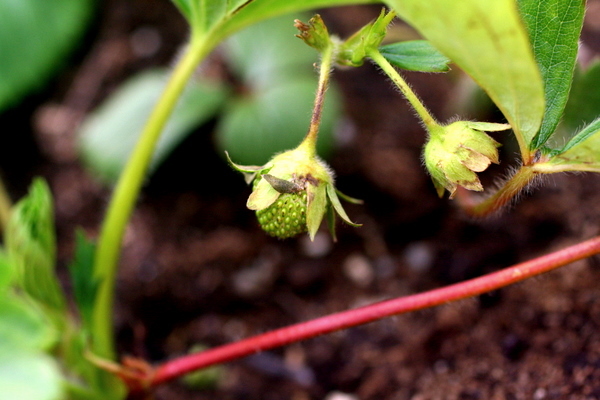 Just spotted a few strawberries appearing on our strawberry plant today as well! Its our first year growing strawberries, so looking forward to getting to taste them.